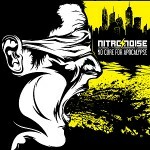 Canadian electro/industrial trio Nitro/Noise will release its second album, No Cure for Apocalypse, on August 12. This limited edition of 300 copies also comes complete with the bonus CD 10 Ways to Doomsday, containing remixes by exciting newcomers like The.Invalid, Sirius, and Rave the Reqviem alongside Rotersand, Grendel, C-Leekktor, FGFC820, Modulate, BlakOpz, and Die Sektor. Nitro/Noise released its debut album, Total Nihilism, in May 2012. Bah, I fell behind on news and am not seeing this until now. Do you know if it’s possible to get the remix album another way? The new album is on Google Play Music and I’m happy about that, but not the remix album.